I am a freemason, and some of the most important figures of the American Revolution were freemasons. This has been the source of many conspiracy theories where the masons has been portayed as the bad guys. Maybe with the exception of the film National Treasure, where we played the good guys, for a change. Two dominant figures of the American revolution were masons. 1st President of the United States, George Washington and the famous Benjamin Franklin were masons, along with a great number of signers of the Declaration of Independence and of the US constitution. A few of the most important figures in Massachusetts during the American Revolution were also freemasons. This is the case of John Hancock, one of the the signers of the Declaration of Independence and later Governor of Massachusetts. Another and the famous Boston silversmith and patriot Paul Revere were masons. 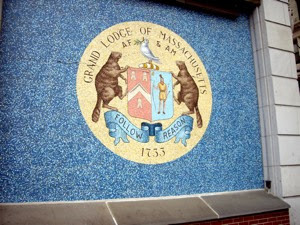 This is the seal of the Grand Lodge of Massachusetts, on the current Lodge Building on Tremont Street by Boston Common. The roots of this Masonic Lodge goes as far back as 1733, i.e. 40 years before the revolution, and before the first Norwegian masonic lodge, Saint John to the White Leopard, was founded in 1749.